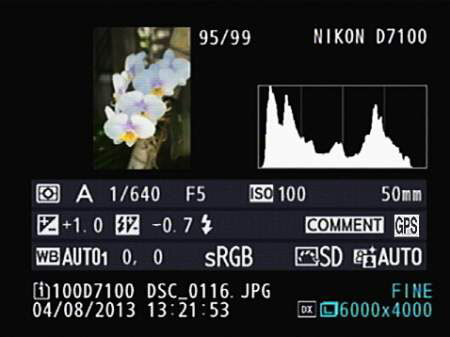 Overview mode on your Nikon D7100 is the second of the two default photo-information modes — meaning that it’s already enabled on the Playback Display Options item on the Playback menu. In this mode, the playback screen contains a small image thumbnail along with scads of shooting data — although not quite as much as Shooting Data mode — plus a Brightness histogram. Just above the histogram, you see the Protected Status key and Retouch Indicator, if you used those features (not shown in the figure). The Frame Number/Total Pictures data appears at the upper-right corner of the image thumbnail. Row 1: This row shows the exposure-related settings labeled in the figure, along with the focal length of the lens you used to take the shot. As in Shooting Data mode, the ISO value appears red if you had auto ISO override enabled in the P, S, A, or M exposure modes and the camera adjusted the ISO for you. Row 3: The first three items on this row, labeled in the figure, relate to color options. The second white balance value shows the amount of blue-to-amber fine-tuning adjustment; and the third, the amount of green-to-magenta adjustment (both values are 0 in the figure). The last item indicates the Active D-Lighting setting. Rows 4 and 5: The final two rows of data show the same information you get in File Information mode.